NXP Semiconductors N.V. (NASDAQ: NXPI), the world’s largest supplier of automotive semiconductors1, has acquired OmniPHY, a provider of automotive Ethernet subsystem technology. OmniPHY is a pioneer in high-speed automotive Ethernet IP offering 15 IP families including the 100BASE-T1 and 1000BASE-T1 standards. 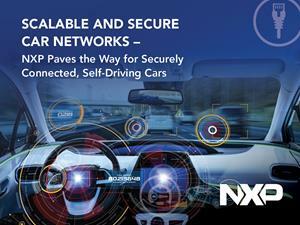 OmniPHY acquisition brings high-speed Ethernet to NXP’s extensive automotive portfolio. Deal delivers critical expertise and Ethernet technology required for autonomous driving including IP experience at speeds up to 100 Gbps. SHENZHEN, China, Sept. 03, 2018 (GLOBE NEWSWIRE) -- NXP Semiconductors N.V. (NASDAQ: NXPI), the world’s largest supplier of automotive semiconductors1, has acquired OmniPHY, a provider of automotive Ethernet subsystem technology. The company’s expertise includes automotive Ethernet, a technology that enables the rapid data transfer required for autonomous driving. OmniPHY’s advanced high-speed technology, combined with NXP’s leading portfolio and heritage in vehicle networks, uniquely positions NXP to deliver the next-generation of data transfer solutions to carmakers. Financial terms of the transaction are not disclosed. An automotive networking revolution is underway, driven by the need for higher data capacity and speed to meet the requirements of increasingly autonomous and connected vehicles. New advanced autonomous driving systems will require gigabit data speeds and beyond. Current plans for next-generation vehicles call for eight or more cameras, high definition radar, lidar and V2X capability, all of which generate steep data challenges for current car networks. These requirements, combined with the modern vehicle’s need to offload data to enable the new business opportunities of the connected car, will soon make terabyte levels of data processing commonplace. As the self-driving ecosystem works to deliver on emerging automotive data requirements, many have turned to enterprise networking solutions as a stopgap measure for testing. Yet long-term solutions will need to be automotive grade and of a size and weight that make their implementation feasible. NXP’s acquisition of OmniPHY, which has already begun to translate 1000BASE-T1 Ethernet for the automotive space, will give NXP a significant position in this rapidly evolving area. OmniPHY is a pioneer in high-speed automotive Ethernet IP and automotive qualified IP for 100BASE-T1 and 1000BASE-T1 standards. Over its six-year history, it has worked with some of the largest consumer companies in the world and has developed competitive 1st-silicon-right solutions for emerging markets like automotive and industrial Ethernet. OmniPHY interface IP and communication technology along with NXP’s automotive portfolio will form a “one-stop shop” for automotive Ethernet. The companies’ technology synergies will center on 1.25-28Gbps PHY designs and 10-, 100- and 1000BASE-T1 Ethernet in advanced processes.